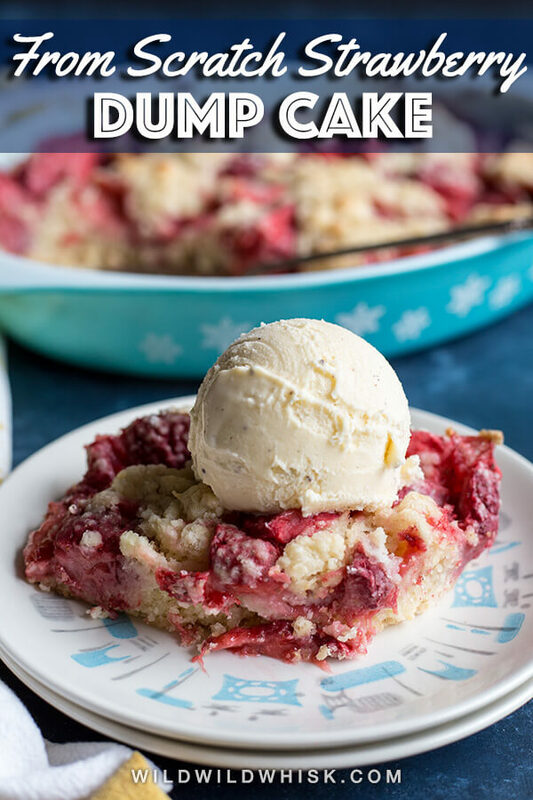 This Strawberry Dump Cake is super quick and easy, yet made totally from scratch. 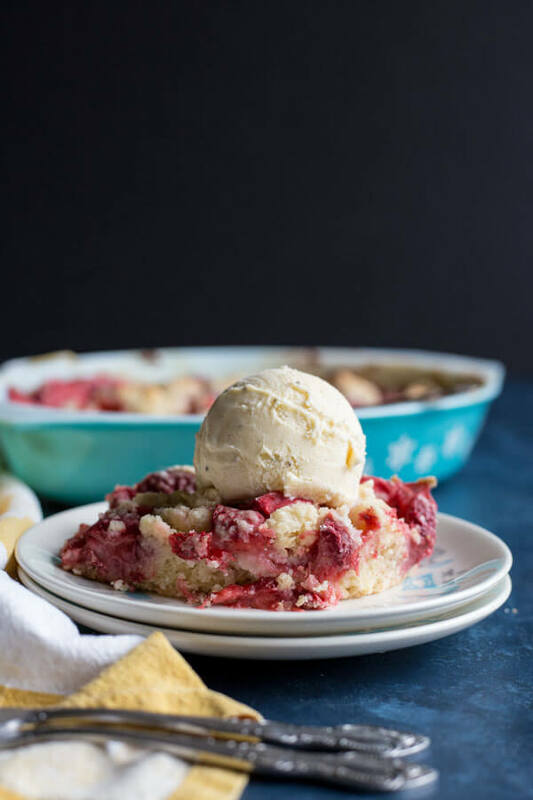 It is delicious on its own but even better with a scoop or two of ice cream on top, a perfect dessert for strawberry season. 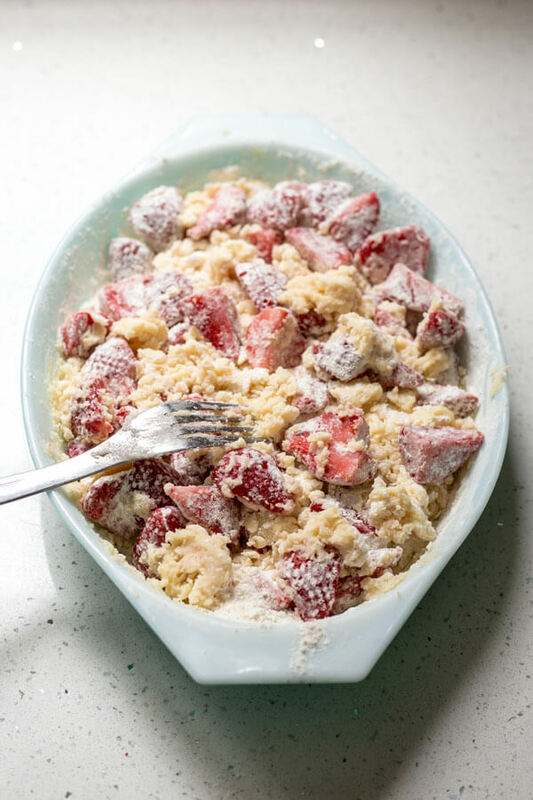 As you stare at all the fresh berries in the grocery stores and farmer’s market stalls this season, buy a little extra to make this quick and easy Strawberry Dump Cake, sans boxed cake mix. 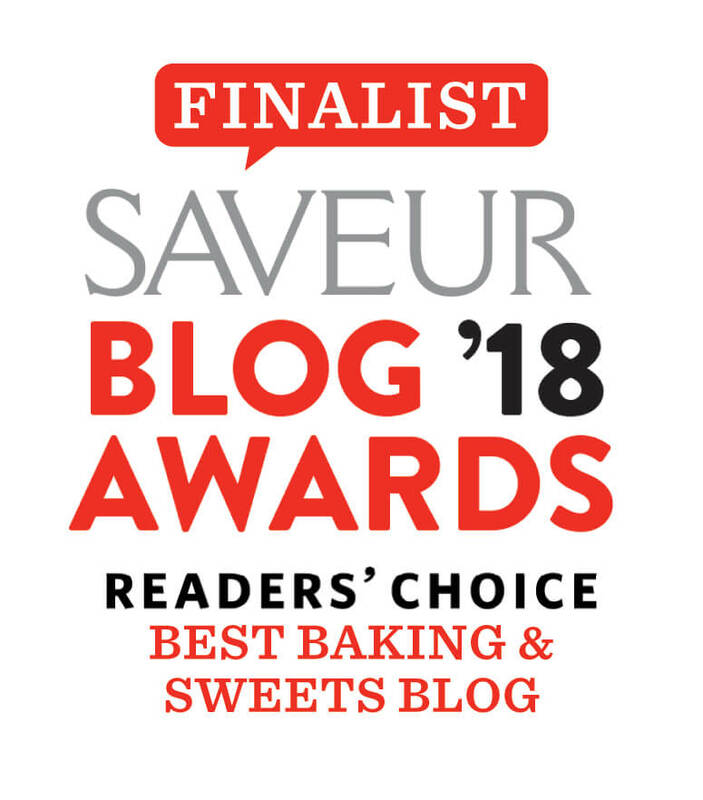 I have nothing against boxed cake mix, I’ve baked from it in the past. But honestly though, you have no need for it because mixing up the flour mixture is really the most work you’ll have to do for this cake. 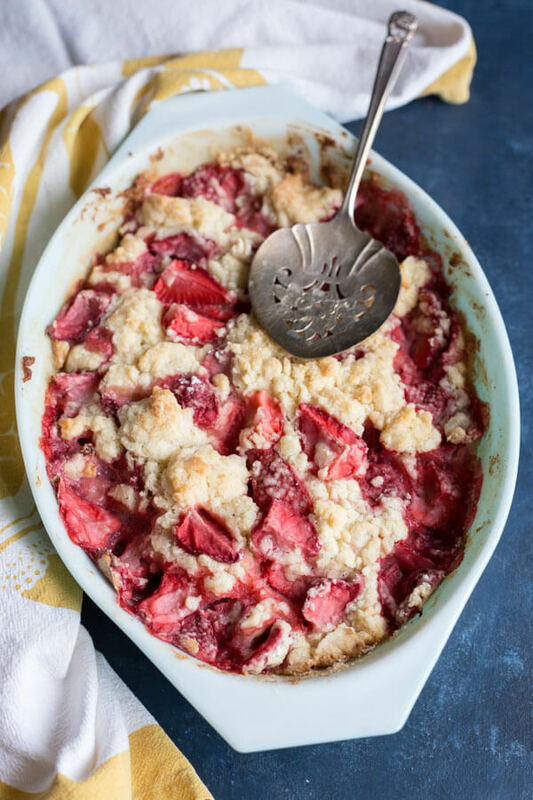 The first ingredient to make Strawberry Dump Cake is obviously strawberry. You can use either fresh or frozen berries in this recipe. I had a lot of left over strawberries one weekend and decided to cut them up and freeze them for later use. They turned out to be perfect for this quick and easy cake. Layer the dry ingredients on top of the strawberries. It is one more step to the recipe but I would add all of the dry ingredients to a separate bowl and mix them first. Then layer on the melted butter, milk and vanilla extract. Toss everything together to mix, but don’t worry if there are a few dry spots. Once in the oven, the juice released by the strawberries will take care of those. This Strawberry Dump Cake came out of the oven smelling like a delicious strawberry cobbler. 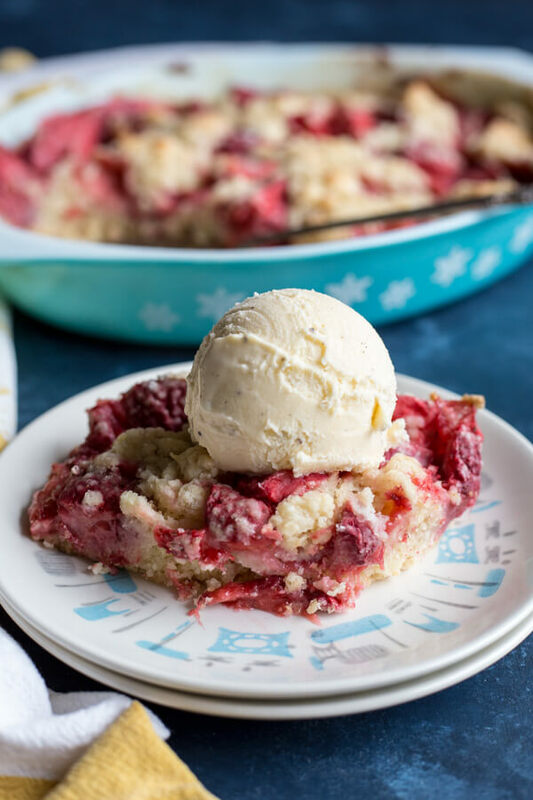 It’s the perfect Americana dessert that tastes amazing on its own and even better with a scoop of ice cream on top. If you want to dress it up even more, add a little whipped cream and strawberry compote to take it over the top. Butter a glass baking dish, 9”x9” or equivalent. 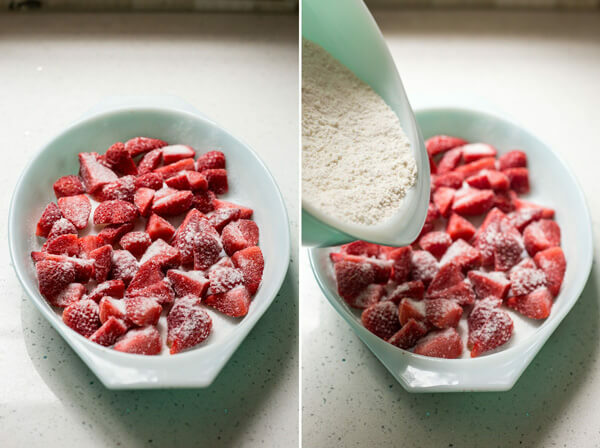 Add strawberry to the baking dish and toss with 1 tablespoon of granulated sugar. 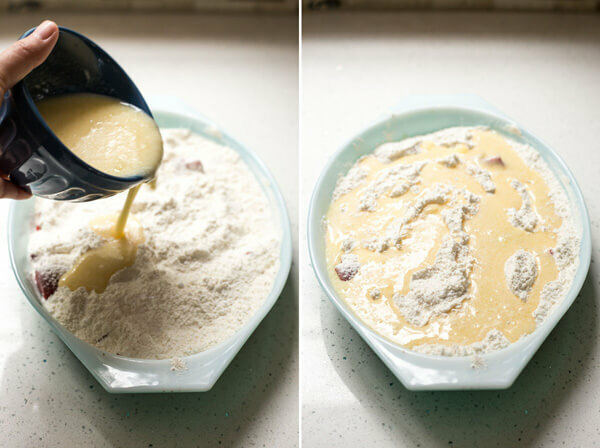 In a small mixing bowl, whisk together the flour, powder sugar, salt and baking powder. Layer the dry ingredient mixture over the strawberries in the baking dish. In a small bowl, mix together the melted butter, milk and vanilla extract. Pour this over the top as evenly as possible. Use a fork to gently toss the wet and dry ingredients together until fairly well mixed. Bake for 40 minutes until the top is lightly brown and the cake is cooked through, a toothpick inserted in the middle should come out clean. Serve warm with a scoop of ice cream. 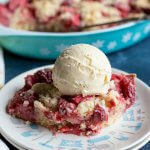 This recipe is adapted from Our Life Tastes Good‘s Blueberry Dump Cake. I was searching for a dump cake recipe made from scratch and all I could find was box mix recipes. 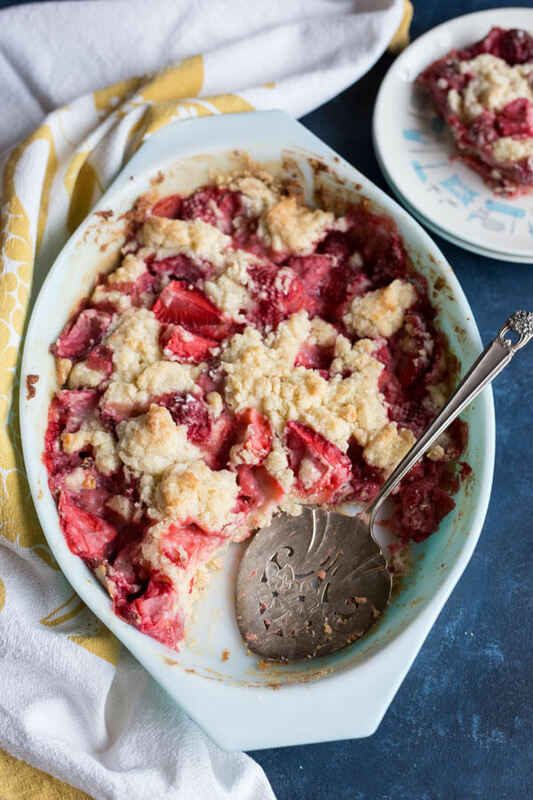 Love this recipe using ingredients from scratch and how loaded it is with strawberries.